ALL YOUR FAVORITE STATS: Displays current, max, and average speed, total distance, trip distance, elapsed time, pace arrow, and clock. WIRED SENSOR: The Velo 7 comes with a wired speed sensor. PERFECT FOR BEGINNERS: The Velo 7 is an entry-level computer that is perfect for beginner cyclists looking to take their riding to the next level. The newly designed Velo 7 is CatEye's entry level 7 function computer. The larger screen is even easier to read and set up is made simple with pre-programmed tire sizes. Battery life up to three years. Weighs 28g. ALL YOUR FAVORITE STATS: Displays current, max, and average speed, total distance, trip distance, elapsed time, and clock. FOCUS ON THE RIDE, NOT THE SCREEN: Don't let navigating menus or buttons get in the way of enjoying your ride. Simply press the base of the unit to toggle through functions. DON'T SWEAT THE SMALL STOPS: Caught at a red light? Stopping for coffee? We've got you covered. 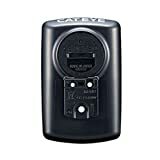 Your CatEye computer knows when you've stopped and automatically stops counting time and averaging speed. You spoke, we listened. Developed from CatEye customer feedback, the Padrone features the largest display available on the market today. From the downhill mountain biker to the farsighted cyclists, the Padrone is ideal for anyone who wants to enjoy a squint-free ride and a fast, simple set-up. Battery life up to a year. Weighs 31g. Secure and convenient bracket for easy installation;Spend less time setting your equipment and more time on the road;Suitable for most bicycles 0.98-1.24 Inch handlebar diameter. 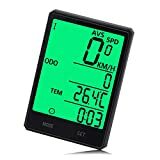 As a bike computer, measuring current / average / max speed, trip distance / ride time, calories and other real-time riding data.Quickly and accurately get the data you need! Need only the distance between the computer unit and the sensor is less than 23 "/ 60cm, the distance between the sensor and the magnet is less than 0.06" / 1.5mm without matching. Suitable for most types of bicycles, such as road cycling, mountain biking, folding bike, common bicycle. 1.Please read the manual carefully before using. 2.We will send every customer a manual as a PDF format. 【3'' BIG LARGE SCREEN 】3 Inch Large LCD Screen Display, With Soft White Backlight, You can read your statistics easily and clearly Day or Night Riding. 【WIRELESS AND ACCURATE 】Wireless Function Make It More Convenient and Advanced，Say Goodbye to Tangled Wires On Your Handlebars. 【LONG TIME BACKLIGHT】capable of keeping the LED backlight Long Time On; makes the display readable all the time when in low light conditions; perfect for night riding. 【SUITABLE NOTICE 】Mountain Bikes，Road Cycling, Folding Bike, Common Bicycle and so on. Just notice the distance of sensor & magnet <5mm, the sensor & Odometer <600mm. Some Electric Bike, or Indoor Bicycle Maybe Can't Keep This Distance, it will not work, Please Confirm It Before Buying. Nellvita Bike Computer with rubber ring and full-sealed compact body. Real Waterproof, works great on rainy days as usual. Touch LIGHT Button for 3 seconds Enter Long Light backlight. Makes the display readable all the time when in low light conditions. Perfect for night riding. 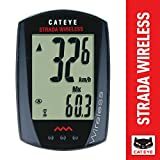 Enables you easily view performance data on your bike computer. The best way to securely lock and perfectly position your computer on your bike, so you can focus on your goals, whether that be having fun or going fast, or both. ALL YOUR FAVORITE STATS: Displays current, max, and average speed, total distance, two trip distances, elapsed time, pace arrow, and clock. SWITCH BETWEEN BIKES: Dual tire size lets you use one computer for two bikes. The original Strada Wireless cycle computer with basic cycling functions in a compact design. Battery life up to a year. Weighs 22g. The Dreamsport advantage: Diving into Cycling accessories over 10 years, for better bicycle computer. 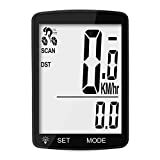 Distance and time: Accumulate the total distance as long as bike's moving, whilst record trip distance, trip time, current time and temperature. What you get: Bike Computer, Mount with Wired Sensor, Speed Magnet, Cable Tie, Manual, 18-month warranty and friendly customer service. This function is particularly useful when crossing the finish line of a time trail, since in a short time the bike still going after bicycle sprint. Ideal motivator indicates the present speed faster or slower than average speed during trip time. + means faster, - means slower. The current speed is always displayed on the the computer with bold digit, convenient for reading. It calculated with the trip timer from the last RESET operation as long as the bicycle moved, display at bottom. The odometer accumulate the total distance as long as the bike is moving. It display current time in 12HR or 24HR clock at your preference. 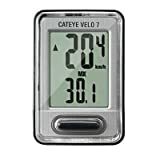 Rolling display of distance, maximum& average speed and trip time, help focus on cycling without press any keys. No matter caught at a red light or stop for coffee, it got you covered, knows when you've stopped and automatically stops counting. At Dreamsport, we believe in our products. That's why we back them all with an 18-month warranty and provide friendly, easy-to-reach support. 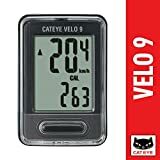 The newly designed Velo 9 is CatEye's entry level 9 function computer. The new, larger screen is even easier to read and set up is made simple with pre-programmed tire sizes. Battery life up to three years. Weighs 28g.